Ethical or Responsible investment (RI) gives you a way to generate wealth over the long term using a prudent, sustainable investment strategy that reflects your personal values. We all want our superannuation and savings to be safe and earn a solid rate of return, but there are other things we care about too. You might feel passionate about the effects of climate change, the provision of affordable and accessible health care services, managing resources sustainably to meet our current needs and those of our aging and growing global population, and supporting the transition to a low carbon economy. RI gives you a way to make your beliefs and convictions an integral part of your financial decision-making. Investing responsibly is also a way to support, and benefit from, solutions to life in the 21st century such as environmentally friendly technologies, sustainable agriculture, microfinance, medical technologies, recycling and waste management, and “green” infrastructure and transport projects. You may have come across other terms such as ethical, green, sustainable or socially responsible investing. These are all different names used to describe what is now most commonly referred to as responsible investment. See also: What Is RI? and What is Ethical Investment? Ask about our ‘Ethical Profiling Questionnaire’ which determines your ethical investment criteria. If you’re motivated to make a difference to the world you live in, responsible investment offers a tangible way to translate these words into actions. Click to Download the Fact Sheet. Values and ethics are back in the limelight and smart investors are demanding greater accountability from the companies in which they invest. Click to Download the Fact Sheet. Responsible investment (RI) is an excellent way to make a positive contribution if you are passionate about the environment and climate change. Click to Download the Fact Sheet. Once upon a time RI was considered a niche market. Today responsible investors come from all walks of life and the issues that motivate them are universal. Click to Download the Fact Sheet. Responsible investments (RI) deliver performance in line with the very best managed investments in the world, while helping to bring about positive change in society. Click to Download the Fact Sheet. 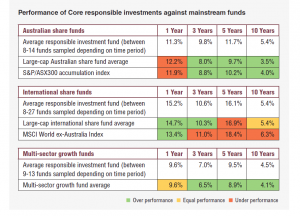 The Responsible Investment Benchmark Report 2018 includes an assessment of the performance of core responsible investment funds compared with their benchmark index and the average of equivalent mainstream funds. The results show that responsible investment funds are largely outperforming their average mainstream counterparts year on year, as the market for responsible investment grows. • International shares: Core responsible investment international share funds outperformed the average mainstream international share fund in the one and three year time horizons, slightly underperformed over the five year term, and matched the ten year term. 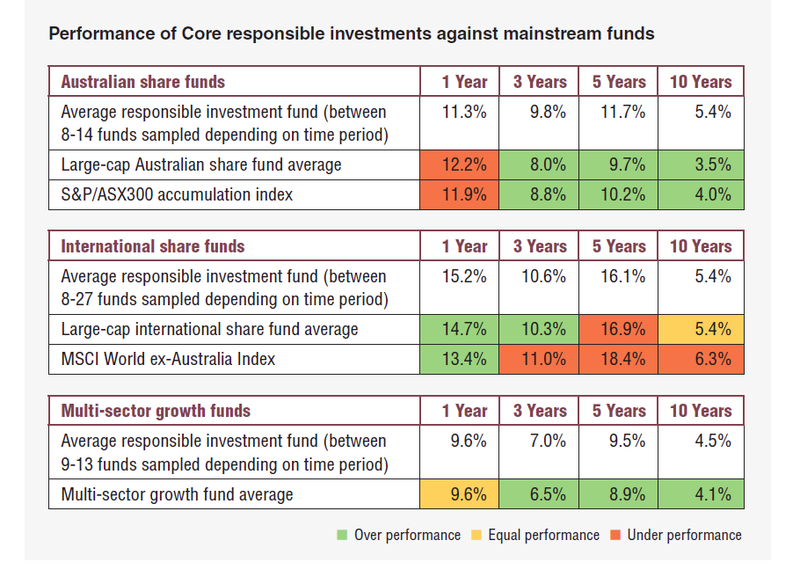 • Balanced funds: Core responsible multi-sector growth funds (balanced funds) matched the one year term and outperformed their equivalent mainstream multi-sector growth fund average for all other time periods. So Why Become an Ethical Investor? To generate competitive returns whilst making a difference to the environment or society. To ensure your money is directed towards companies making a positive difference to the environment and the impact of climate change whilst avoiding those that cause harm. As a way to influence corporate behaviour and push for greater accountability on issues like employment and trade conditions, environmental sustainability and good corporate governance. To take your social or consumer activism to the next level. The range of responsible investments available in Australia is extensive and growing all the time. There are products or services for every life stage, time frame and risk profile. Responsible investment is a way to generate competitive returns and find sustainable solutions to many of the challenges we face in the 21st century. You can open a savings or loan accounts with a bank or credit union that follows responsible lending and business practices or take out a “green” home or car loan. Contact Us Speak to JustInvest Financial Planning today on (08) 9322 1110 or send us an email to find out how investing ethically can help you grow your wealth. Responsible investment is a strategy used by investors in order to incorporate environmental, social, governance or ethical factors into their investment choices and ownership practices. The Responsible Investment Certification Program is the first of its kind in the world and is owned and managed by the Responsible Investment Association Australasia (RIAA). The Program was created in 2005 in partnership with the NSW Department of Environment and Conservation and the Victorian Government. The Responsible Investment Certification Program helps investors by providing standardised and consistent information about certified responsible investment products, services and policies. To be licensed to use the Certification Symbol, James Baird was required to meet strict disclosure requirements for the category of Financial Adviser. The Certification Symbol signifies that an investment product, service or policy takes environmental, social, governance or ethical considerations into account along with financial returns. James and JustInvest Financial Planning’s processes were also independently reviewed. Key details regarding the Certification are available through RIAA’s website or by calling RIAA on (02) 9025 5711. The Certification Symbol is a Registered Trade Mark owned and managed by RIAA. The Responsible Investment Certification Program does not constitute financial product advice. See www.responsibleinvestment.org for more details. The Certification Symbol signifies that James Baird of Sentry Financial Services offers Responsible Investment products; has undertaken continuing professional development on responsible investment; and conducts inquiries regarding client concerns about environmental, social, governance or ethical issues. The Symbol also signifies that James Baird has adopted strict disclosure practices required under the Responsible Investment Certification Program for the category of Financial Adviser. The Certification Symbol is a Registered Trade Mark of the Responsible Investment Association Australasia (RIAA). Detailed information about RIAA, the Symbol and James Baird can be found at www.responsibleinvestment.org, together with details about other responsible investment products and services certified by RIAA.